Investment Idea: $100 invested in 1.962 shares of Kelloggs stock using a Direct Purchase Plan. Total Time Spent on Investment: Ten minutes researching about what a Direct Purchase Plan is, and ten minutes signing up and crediting a new ShareOwner.com account. A lot of my investments (being at the $100 price level) end up having fees and extra costs that cause the investment to almost never end up being profitable. When buying stock I am paying $9.99 per a trade at TDAmeritrade, and given some places offer trades for as low as $5, it would still be another $5, or in my case $9.99, charged when I sold the stock too. This means that all the current stock investments I have would need to earn over $20 just for me to break even! Luckily there is another way people buy stocks and build a portfolio: a DPP, or a Direct Purchase Plan. DPP’s exist for a lot of the largest companies in America including Heinz, General Mills, CBS, and Kelloggs. I decided to choose Kelloggs as the company I wanted to purchase, because I gotta have my pops. (I gotta have my pops)There are couple of ways to buy direct purchase plan shares. The easiest is ShareOwner.com. It is run by WellsFargo and has access to a lot of different companies, so with one account you can buy shares in multiple companies, and help create a diverse and robust portfolio, a key to good investing. On ShareOwner, you can see a sortable list of all DPP companies. DPP’s often come with minimum investments, which were shown in the ShareOwner table. This limited which company’s I could choose from, but then I saw Kelloggs which did not have a minimum and is a company I feel pretty confident about. As well as having a minimum investment, some companies also force you to already be an owner of that company’s stock before participating in the plan. Kelloggs was not one of these so it made it an even better option. After finishing signing up for my ShareOwner account, I was given the option to fund my account. Either I could do it by mail or electronically. If you select the electronic option it then prompts you telling you you will need to pay a $15 electronic investment fee. ($15 Electronic fee BS)Nowhere during the whole process did it mention this fee until the last page of the sign up. It gave a couple of options: either you can pay electronically or select pay by mail. When you select this option it does not mention any fee, but it seems like more hassle. Of course I did not want to spend an extra $15, so I chose pay by mail. Only after fully signing up did this fund by mail option also inform me I would need to pay a $15. Talk about hidden fees. However through some glitch if you select pay by mail it creates your account and you can just fund the account electronically right away. I went ahead and did this and I still have never mailed in my $15 account funding fee. I assume one day they will get mad about it, but until then I saved myself $15. A week or two later I received an email saying that the account was funded and I now owned 1.962 shares of Kelloggs stock. One of the main problems with buying it via the direct purchase plan was that I had no control over exact timing of my stock purchase. For all I know the moment I bought the stock it could have hit historic highs and I would be stuck buying it at the highend, meanwhile when I use TDAmeritrade I can choose an exact action to trigger when I buy the stock, and guarantee I am purchasing it at a price I want. Two of the benefits of the DPP are that it allowed me to purchase exactly $100 worth of stock, making it very easy to stick to my $100 investment strategy. Also, the investment is on autopilot now since it is set to have all of its dividends the shares accrue to be reinvested into the buy, allowing my stock to grow. A similar investment to a DPP is DRIP, or a Dividend Reinvestment Plan, another investment I can make through ShareOwner and another investment I will add to my portfolio very soon. Tired of being burned by the fees I got from each trade I made on TDAmeritrade ($9.99!) I decided to try out a Direct Purchase Plan, which allows me to buy the shares directly and not have to pay brokerage fees. However it is some what of a hassle and seems to come with hidden fees of its own ($15!). As for the company to invest in, I chose Kelloggs since I believe it is a strong well positioned blue chip company which can help balance out my portfolio. Simply put, I gotta have my pops. The return from a DRIP is based on the continuing growth of the shares and of the reinvestment of any dividend the shares produce put back into the investment. This investment is currently valued at the share price of Kelloggs times 1.962 (The number of Kelloggs shares I own). To find an up to the minute price of my Kelloggs Direct Purchase Plan investment and my other investments click here! Total Time Spent on Investment: 10 minutes to set the trade trigger on TD Ameritrade. In order to get set for this investment I logged into my TD Ameritrade account and searched for stock ticker YELP. It came up and was trading at a price of $24. That seemed to be way too high, and buying four shares for a total of $100 at $25 a share didn’t seem ideal. 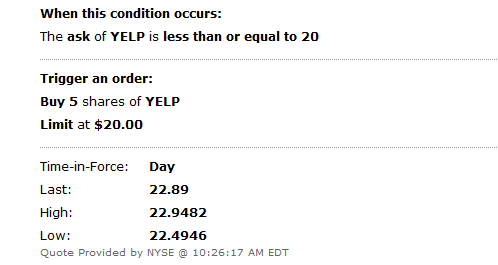 Instead, I set a stock trigger to buy five shares of Yelp if the price hit $20 a share. Low and behold, only a couple of days after setting the trigger a load of bears showed up and shorted the stock. As you can see the price is now hovering below the $20 amount I paid for it. Yelp also has an earning call on August 1st, so hopefully they will have some good news and the tide will turn back in my favor. Excluding the recent bearish trend on this stock, I personally believe Yelp is a great service and is still well positioned in the reviews/restaurant local search market place. This market, which I consider to include such sites as MenuPages and OpenTable, is ripe for acquisition and mergers. After the Instagram deal, a billion dollar acquisition no longer seems like that much of an impossibility. Last year Google purchased Zagat, and ironically, the person who led that acquisition was none other than Marissa Mayer,* who has since left Google and now heads up Yahoo. As the battle for ad dollars continues to grow I feel another attempt at acquiring Yelp is on the way, either from Google, Facebook, or Microsoft. However I wouldn’t rule out a surprise buy out by Apple, who is flush with cash, and looking for ways to better compete with Google, and help soup up it’s Siri voice search app. At the time of writing this, Yelp’s market capitalization was hovering at around $1.2 billion dollars, allowing for one of the aforementioned big four to come in and scoop it for most likely a $2 billion dollar price tag. When setting the buy trigger on this investment I intentionally set the price at a low amount of $20. I believe that Yelp has a very real chance of being acquired in the next year or so, and at a price range of $35+ a share. To find the current value of this investment, take the current price of a share of Yelp and multiply it by five. To find an up to the minute price click here! Total Time Spent on Investment: 10 minutes of research. 5 minutes spent online signing up. With talk of ever booming oil prices caused by global warming, and new found global demand, I wanted to get a piece of the action. Unfortunately, I knew that you couldn’t just buy the real thing and store it yourself. There is no easy way to buy oil and store it and then hope to resell it while making a profit on such a small operation. It all reminds me of the great “It’s Always Sunny in Philadelphia” episode titled, “The Gang Solves the Gas Crisis,” in which the gang decides to buy gas and hoard it before the price raises. However, they run into a whole bundle of issues, from trying to store it, transport it, and even trying to sell it. Below is a clip from the episode. That sounds like a whole lot of gibberish, but basically it simmers down to mean that the USO’s price tracks almost spot on with the current price of sweet crude. To illustrate this, below is a chart of the year to date performance of Oil and USO. (Oil looks to be tanking)As you can see, the red line for Oil and the blue line for USO turn practically purple with all of their overlapping. Anther quick takeaway is that it looks like oil is doing horribly. Perhaps this is a good sign, and that the market is at its bottom, a great time to buy in to it! After reading more about USO, I went ahead and checked it’s stock price. It had been around $33.40 a share the day I checked. This was perfect. If it could just drop to $33.33 I could buy three shares for a total as close to a $100 investment as possible. I needed a place to buy and sell stocks cheaply, so I went to Google and found TDAmertitrade. It seemed to have good reviews, so I went and signed up for an account. If you guys want one too, email me ahead of time so I can get some referral money! Unfortunately TDAmeritrade has a minimum deposit of $500, so I placed $550 into the account since I assume that each stock trade would cost around $10 and I would be making five or so total stock investments. Unfortunately, by the time my account was fully set and funded, a couple of days had passed and the stock price of USO was now hovering at $34.50. I got worried. Had I missed the bottom? Was this stock on the up and up again? Since I had missed my initial window of buying the stock at my ideal $33.33 price tag, I needed to just wait for it to hopefully drop again. 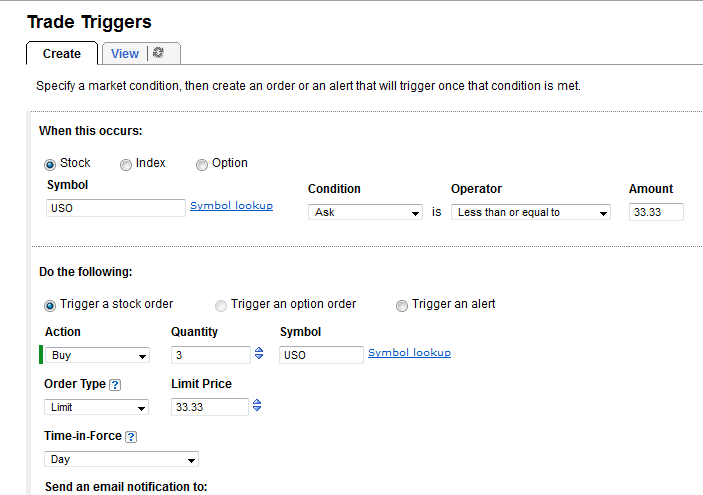 TDAmeritrade has an awesome tool called Trade Trigger, where you can set a trade to automatically occur when a certain condition is met. 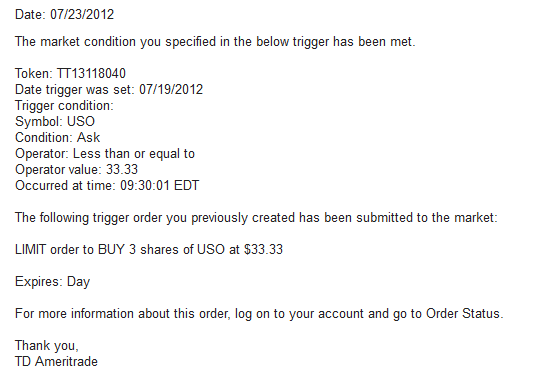 In my case, I set the trigger to fire when the ask price of a share of USO was $33.33. When this condition was met it would then buy 3 shares of USO at a total price of $99.99. And I would even be sent an email when it had happened. (USO Trade Trigger is set)And then I waited. This morning when I checked my inbox a new email arrived, subject, “Trade Trigger order activated.” Now that was exciting. (USO shares bought)I logged into my TDAmeritrade account and sure enough a debit of $109.08 ($9.08 fee per a trade) had came from my cash supply, and I was now the proud owner of three shares of United States Oil Fund. The price of oil and of gas has seemed to be steadily on the rise. Even as people try to turn more green or use hybrid vehicles, there is still a booming market for gas guzzlers in India and China, as people turn in their bikes and reach for the keys. I personally don’t see this trend changing anytime soon and feel holding on to some oil will pay out nicely in the long run, even as oil seems to be down for now due to the slow economy. This investment’s return is based on the stock price of USO multiplied by three, for the three shares of it I own. To find an up to date price click here! A “target-date” fund is a mutual fund consisting of typical assets such as stocks, bonds, cash or cash equivalents. The percentage mix of assets is reshuffled automatically by the fund to meet the objective of the investor by a certain future date, such as retirement. The main advantages to a target-date fund are: low minimum investment which provides for greater diversification of outside investments, the fund is managed by a professional fund manager, and there is low investor maintenance or monitoring once the initial investment has been made. As the preselected date approaches, a target-date fund will shift assets towards more conservative investments to avoid or attempt to mitigate any downturns in the economy. This re-allocation is done with no direction or input of the investor but by the mechanics of the fund itself. When selecting a target-date fund, it is important to examine the initial composition of the fund assets. All funds typically have different percentage allocations based in equities or stocks, bonds, and cash. The difference between the funds rests in the make up of the allocations. One fund may be made up strictly of domestic equities and treasury bonds, while another fund may have a portion of the equities and bonds based internationally. There can be other differences among funds, such as what type of equities are in the asset mix, whether they are large, small or mid-cap stocks, or if the equities are from emerging markets, or the type of bonds and cash equivalents that make up a portion of the fund. A disadvantage of a target-date fund is that they are not independent. The target-date fund is usually a compilation fund made from the offering company’s other funds. This compilation of other funds can lead to higher expense fees depending upon how a fund company computes their charges, the fee for managing the target-date fund may include all or part of the fees charged for the component funds. Hence the investor in the target-date fund is paying a fee for the cost of managing the component fund as well as the target-date fund. Whether an investor should or should not invest in target-date funds depends upon how much the investor wants to be actively involved in the management of his or her retirement fund. If the investor wants to be an active participant continuously until retirement, then a target-date fund is not the best investment choice. Conversely, if an investor does not want to be involved in the direction or management then a target-date fund offers that convenience, however, the more passive investor will need to investigate, compare, and analyze the target-date fund before committing to invest in the fund in order to assure that the retirement goals will be met. An investor must perform due diligence with any fund. With a target-date fund the diligence and investigation must be in depth and up front. With a more traditional self-directed fund the investor must continually monitor during the entire investment in the fund. Trading stocks online is very easy to do, all it takes is for someone to open up an account and deposit money. Even though the process is quick doesn’t mean a lot of research shouldn’t be done before someone chooses to pick a broker. Most stock traders open up a practice account with traders that offer it. A practice account will show you almost everything you need to know about a stock broker like execution time and the transaction fee. Creating a practice account for every stock account can take a long time and a lot of effort. Online reviews of stock brokers can become a very useful tool to take advantage of. Once someone has found the broker that he is comfortable with the next step should be preparing to trade. A trader should decide how he wants to trade, rather if it be day trading or trading once or twice a month. A trader without a plan can become self destructive in the long run. Creating a trading strategy should be a trader’s next step. A stock trader should have a written down strategy of how he wants to trade. This strategy should include how much the trader is willing to lose before he sells his stock and how much he is looking to gain. This is a very important step because if a trader gets greedy then he can end up losing his whole portfolio instead of just a percentage of it. Tools are a great asset when someone is trading stocks. Trading tools can be anything from stock charts or software’s that can help trading. Most brokers have trading tools on their site that traders can take advantage of. Some brokers have more tools than others so trading tools should be something to consider before someone starts to trade. If the broker that a trader signed up for does not have the necessary tools for him to trade then he can always download software’s individually from dealers online. The next step for a trader is to fund their account. A good investor knows he should only risk money that he can afford to lose. There are different stock trading order types that are good for certain situations. A trader needs to know all of them to maximize profit. Taking notes is another great asset because learning what went wrong or right can be useful for the next trade. A lot of traders skip over some valuable steps when they are beginning to trade and end up losing all of their trading money. It is true that no one can predict the market every time but knowing certain steps and procedures can increase the chances of earning profit in the long run.